and the attractions of downtown Orlando. 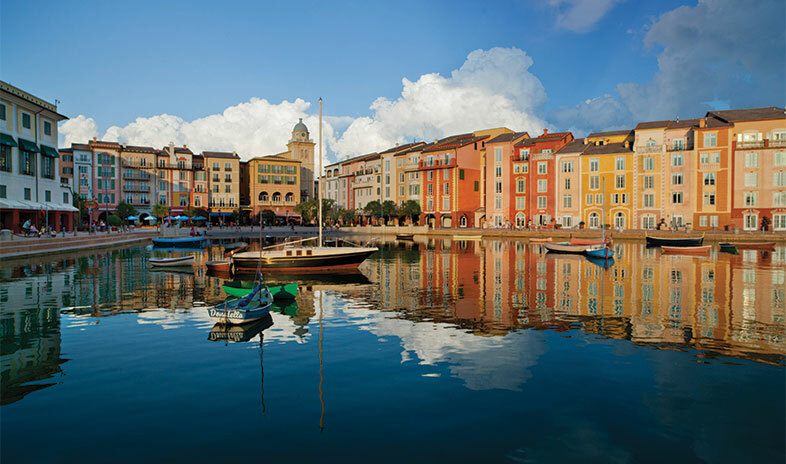 Loews Portofino Bay Hotel at Universal Orlando whisks groups away to the Italian Riviera in Florida. Upscale and sophisticated, casual and comfortable, romantic and yet businesslike, the richly themed simulation of Portofino, Italy, features 750 newly renovated accommodations and 42,000 square feet of space for events and meetings of up to 1,380 people. In addition to the 10 rooms of flexible, indoor conference facilities, which range from intimate to magnificent, planners can also choose from a wide variety of outdoor venues, including the scenic Harbor Piazza, dazzling Villa Pool terrace, and gazebo-graced Citrus Piazza. In a setting more like a bay-side village than a hotel, all eight bars and restaurants add to the sense of la dolce vita. The choices range from cappuccino at a full-service Starbucks to grappa at Bar American, from home cooking at Mama Della’s to contemporary fine dining at Bice Ristorante, and from pizza at Splendido Pool Bar & Grill to biscotti and homemade gelato at Gelateria. La dolce vita extends to the Beach, Villa, and Hillside Pools; a world-class Mandara Spa and fitness center; bocce courts; and the ability to bypass lines at most Universal Orlando attractions. What’s more, the Universal affilliation gives planners the chance to combine their programs with the excitement of Universal Orlando. Enhancements available to engage, entertain, and inspire in new ways include character moments and atmospheric entertainers. Excellent Conference Service Staff. Large property so meeting space is spread out and sometimes not convenient to other meeting rooms. You think you are in Italy. Hotel provides excellent venues for entertaining. Boat shuttle service provided to Universal Park and City Walk. Several dinining options available on site for individual and group events. Facility is great property for adults and not just children. Golf and and spa available. I would consider taking another group.